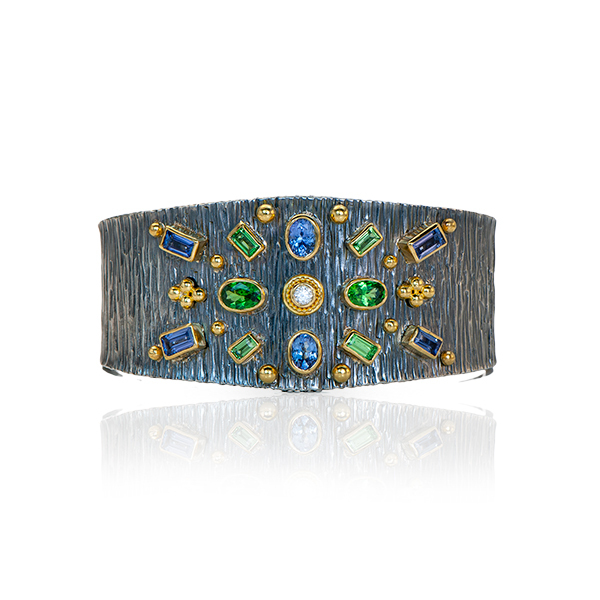 Cuff bracelet is set with Tanzanites, Tsavorites and Diamonds in 22kt yellow gold on a forged and oxidized sterling silver tapered band. 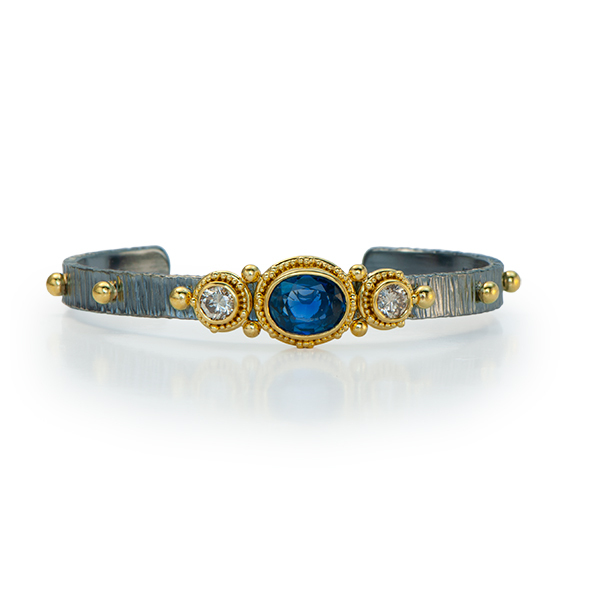 Cuff bracelet is in forged and oxidized sterling silver, 6mm wide, and set with a Blue Sapphire (3.17cts) and Diamonds (.78tcw) in granulated 22kt yellow gold. 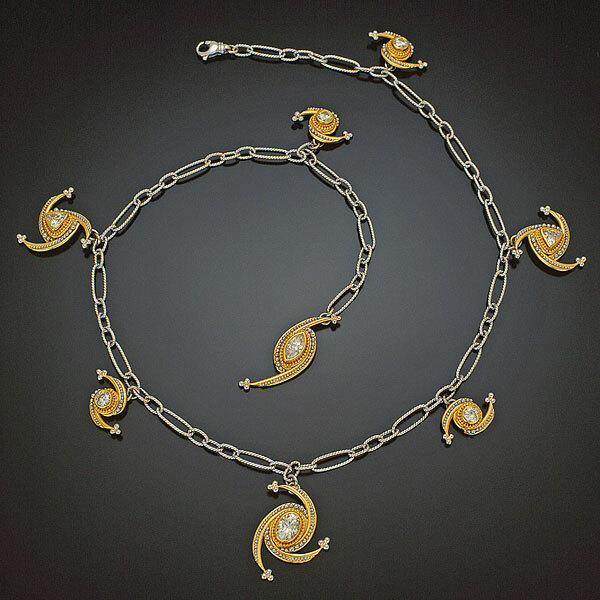 Necklace has one strand of White Opal roundels with a 22kt and 18kt yellow gold clasp set with a Diamond, 25″ total length. 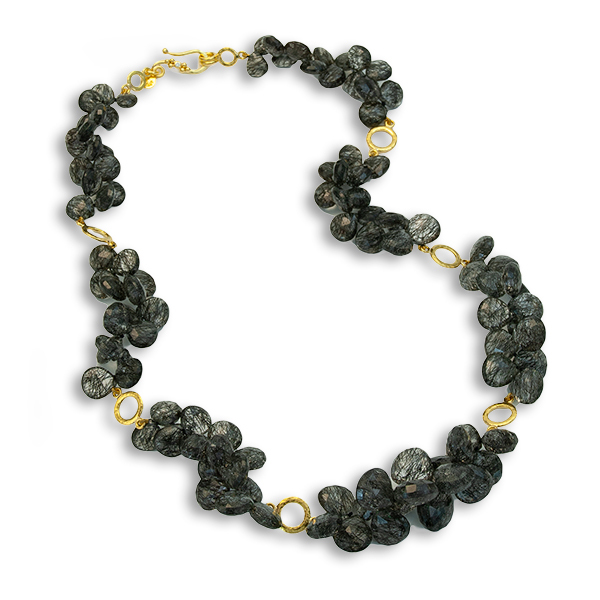 Necklace features one strand of Tourmalinated Quartz Briolettes interspersed with 22kt yellow gold links and a 22kt and 18kt yellow gold clasp set with a Diamond. 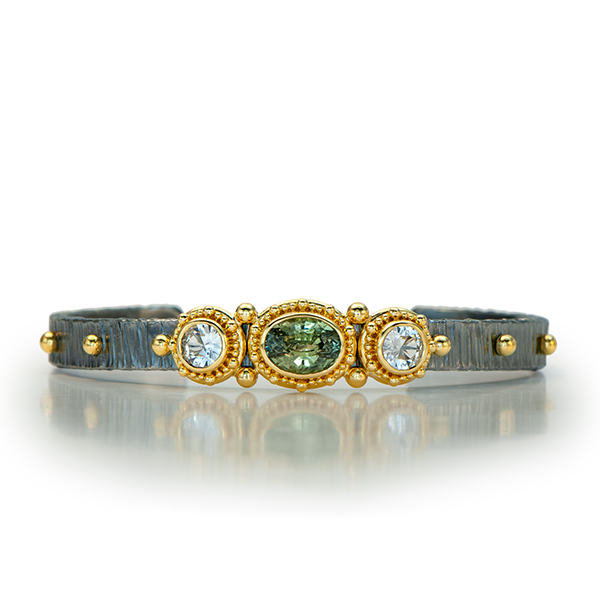 Cuff bracelet in forged and oxidized sterling silver, 6mm wide, set with a Green Sapphire (2.40cts) and two White Sapphires (1.13tcw) in granulated 22kt yellow gold. 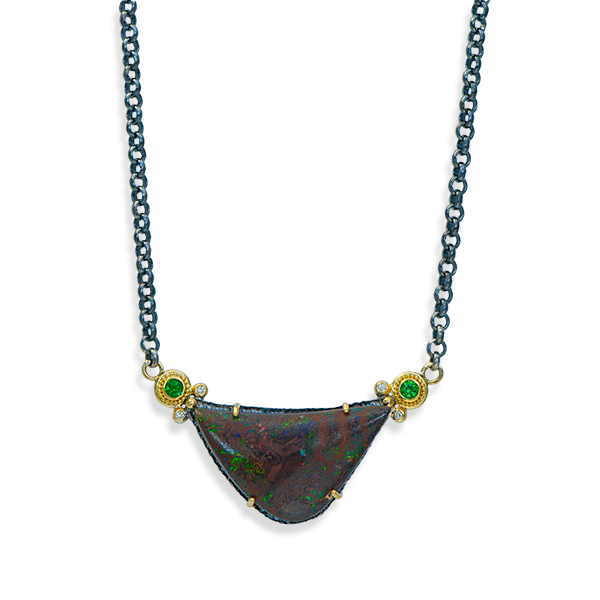 Necklace is set with an Australian Boulder Opal (37x22mm, 38.88cts), Tsavorite Garnets (.32tcw) and Diamonds (.06tcw) in granulated 22kt yellow gold, a forged and oxidized sterling silver frame and an oxidized sterling silver necklace, 22″ total length. 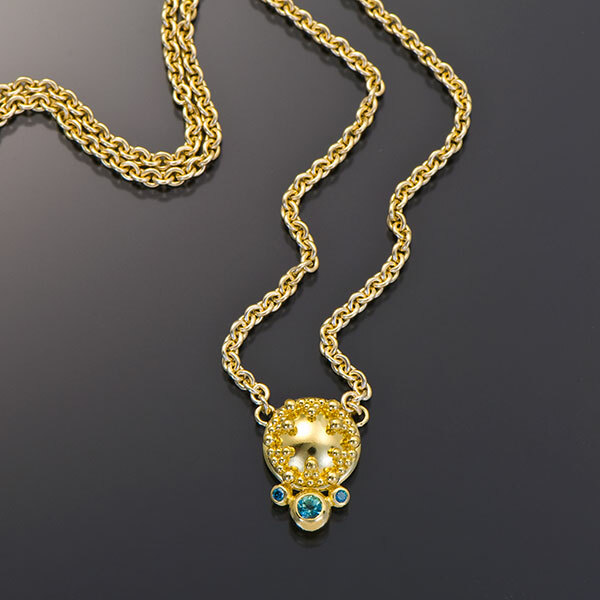 Necklace has one strand of Carnelian briolettes and Sleeping Beauty Turquoise beads with 22kt yellow gold links, a granulated 22kt yellow gold drop and an 18kt yellow gold hook clasp set with a Diamond (.015cts), 19.5″ total length. 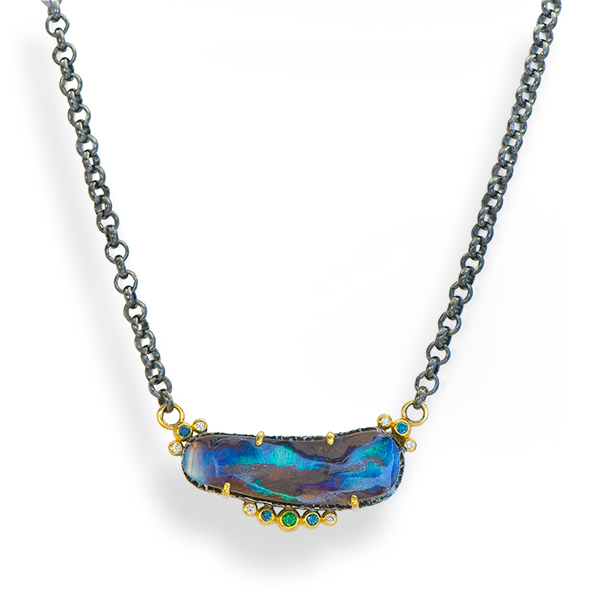 Necklace is set with an Australian Boulder Opal (15.0cts), Tsavorite Garnet (.07cts), Teal Diamonds (.12tcw) and White Diamonds (.09tcw) in 22kt yellow gold on a forged and oxidized sterling silver frame attached to an oxidized sterling silver necklace, 21.5″ total length/center element 1.5″W. 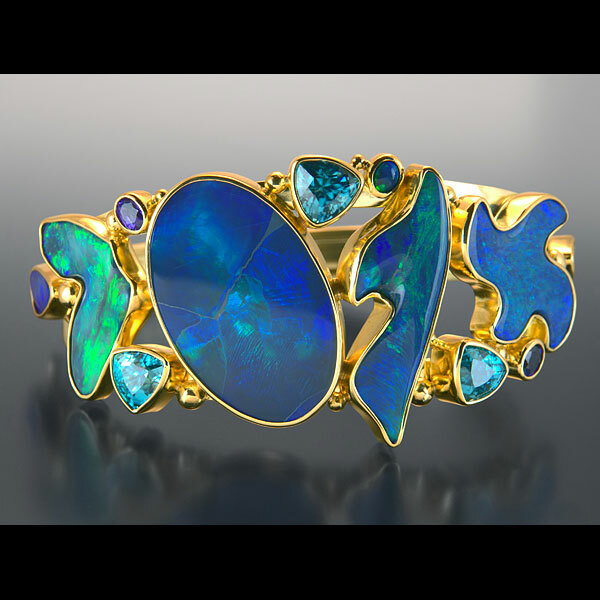 Cuff is set with an Australian Boulder Opal (15.13cts), Teal Diamonds (.19tcw) and White Diamonds (.03tcw) in granulated 22kt yellow gold on an oxidized sterling silver cuff. 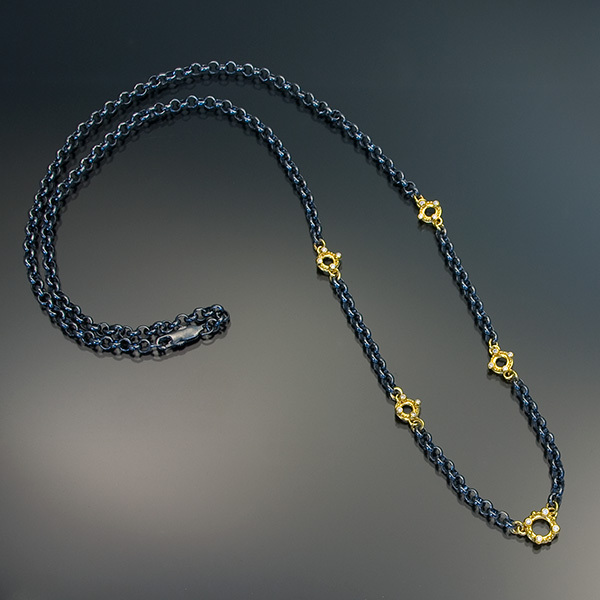 Necklace features 5 granulated 22kt yellow gold links (one larger central link flanked by two smaller links on each side) and set with Diamonds (.22tcw) on an oxidized sterling silver chain, 26″ in length. 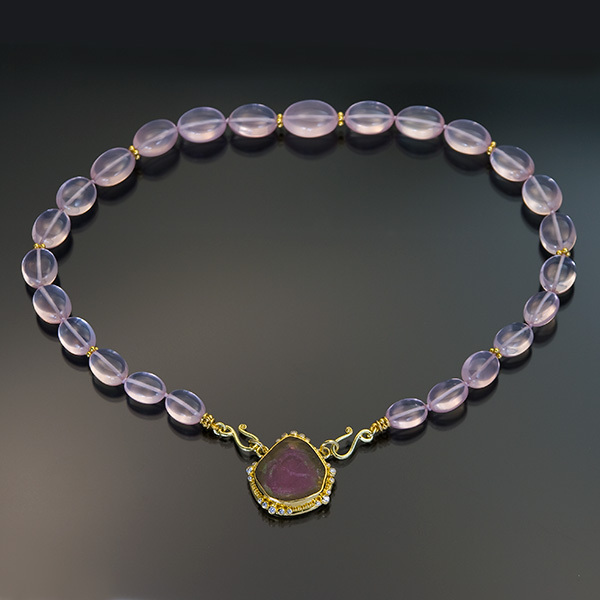 Necklace has one strand of Rose Quartz oval beads with 22kt yellow gold spacers and terminations, 18kt yellow gold shepherd’s hooks and a removable clasp. The clasp is set with a Watermelon Tourmaline slice (23×20.8mm) and Diamonds (.36tcw) in granulated 22kt yellow gold with 18kt yellow gold links. Overall length: 17″. 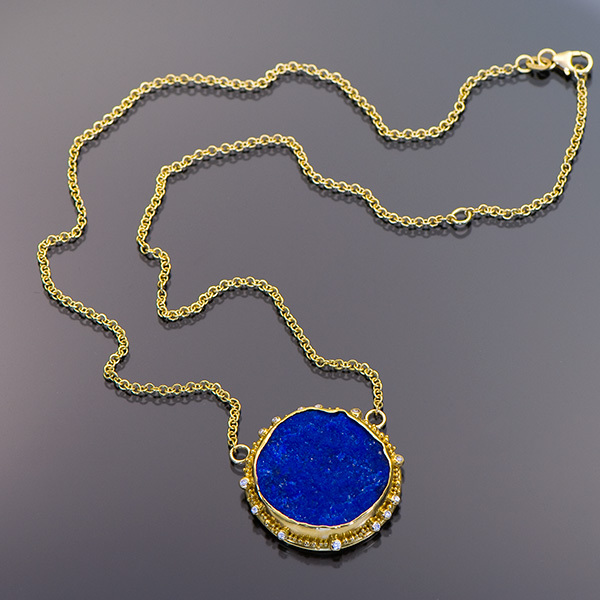 Necklace is set with a Lapis surface slice (25mm, 26.36cts) and Diamonds (.15tcw) in a granulated 22kt yellow gold station attached to an 18kt yellow gold cable chain, 19″ total length & adjustable to 17″. Bracelet is set with Diamonds (.81tcw) in granulated 22kt yellow gold with an adjustable clasp in 22kt and 18kt yellow gold, fits up to 8″. 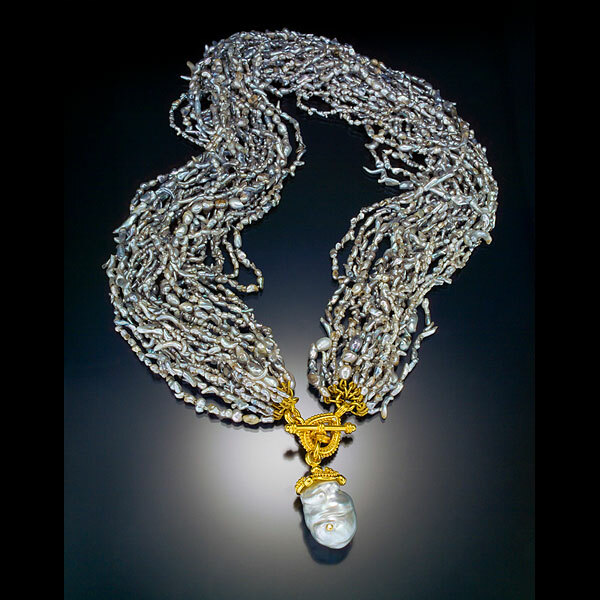 Necklace is set with a Diamond (.07cts) in granulated 22kt yellow gold element on an 18kt yellow gold 2mm cable chain, 16″ in length. 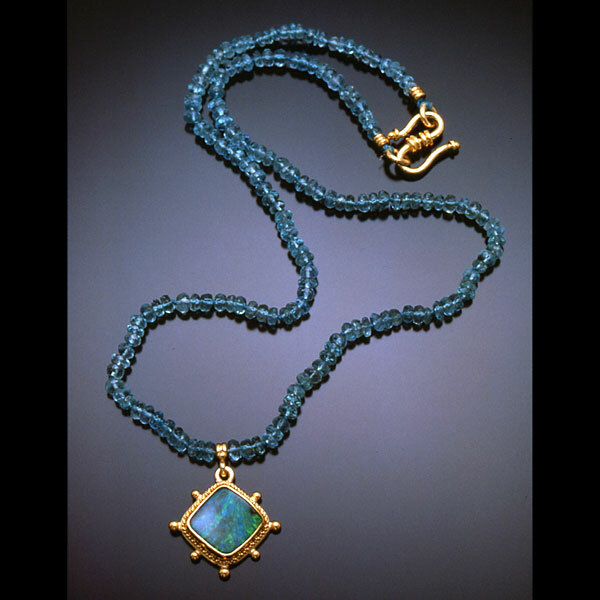 Necklace is set with a Mint Green Tourmaline (.07cts) and Teal Diamonds (.03tcw) on a granulated 22kt yellow gold button (3/8″ in diameter) on an 18kt yellow gold 2mm cable chain, 18″ in length. 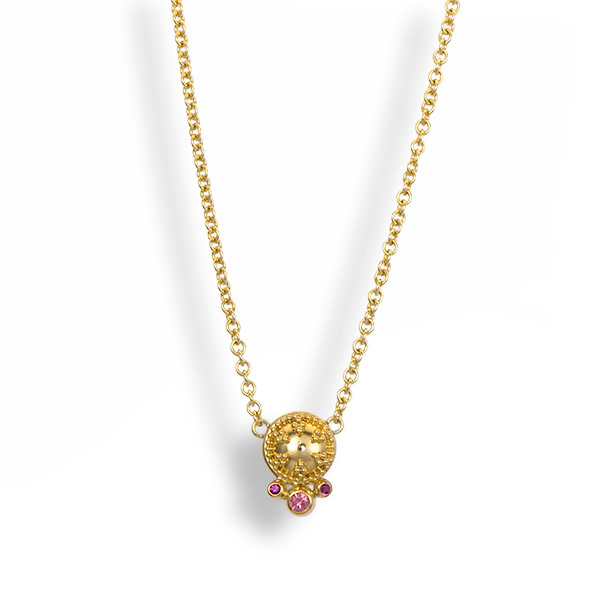 Necklace is set with a Padparadscha Sapphire (.08cts) and Hot Pink Sapphires (.04tcw) on a granulated 22kt yellow gold button (3/8″ in diameter) on an 18kt yellow gold 2mm cable chain, 16″ in length. 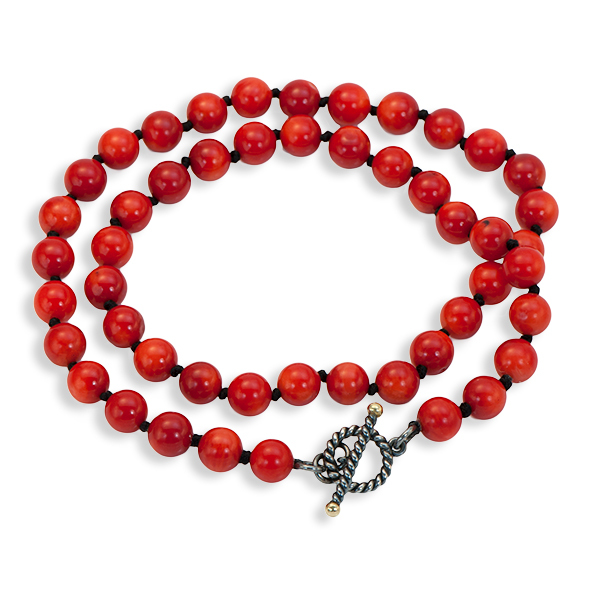 Necklace has one strand of vintage Sardian Coral beads (8-8.5mm) with an oxidized sterling silver and 22kt yellow gold toggle clasp, 19.5″ in length. 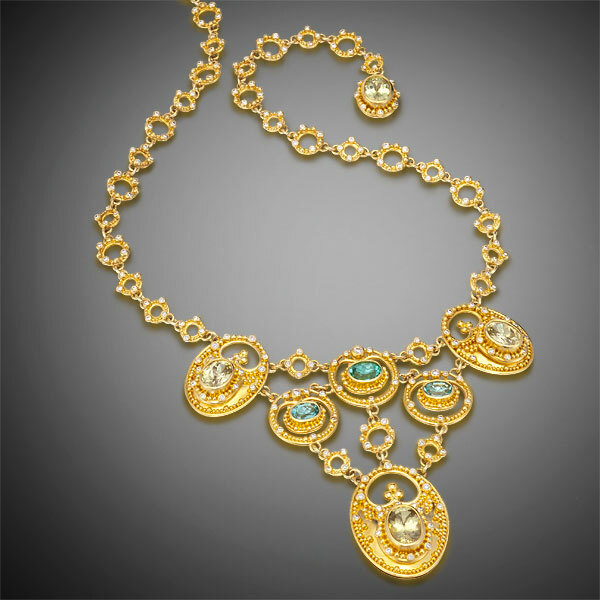 Necklace is set with a Mint Green Tourmaline (.07cts) and Teal Diamonds (.02tcw) in a granulated 22kt yellow gold button fixed to an 18kt yellow gold chain, 16″ in length. 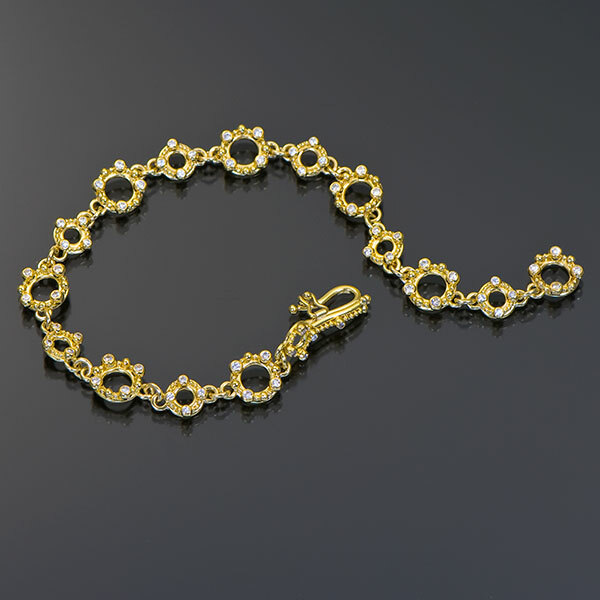 Bracelet has four different styles of 18kt yellow gold chain links with a granulated 22kt yellow gold toggle clasp, bead and charm. The toggle is set with Lilac Garnets and the charm is set with Demantiod Garnets. 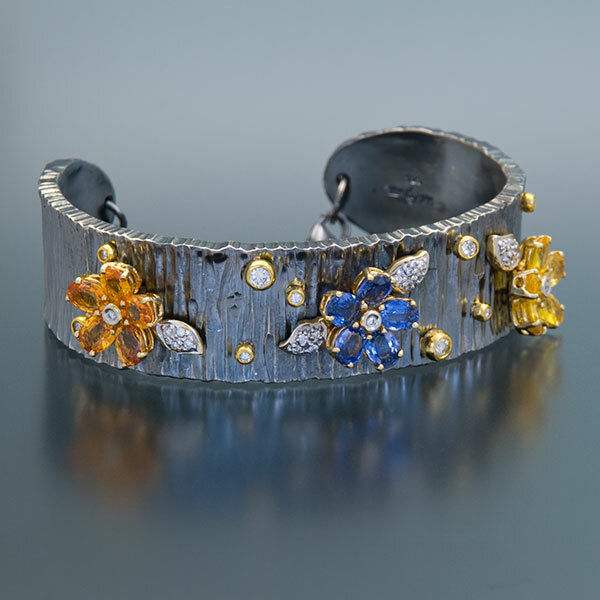 Cuff bracelet is in forged and oxidized sterling silver with Sapphire “flower” and Diamond “leaf” elements interspersed with Diamonds set in 22kt yellow gold granules. 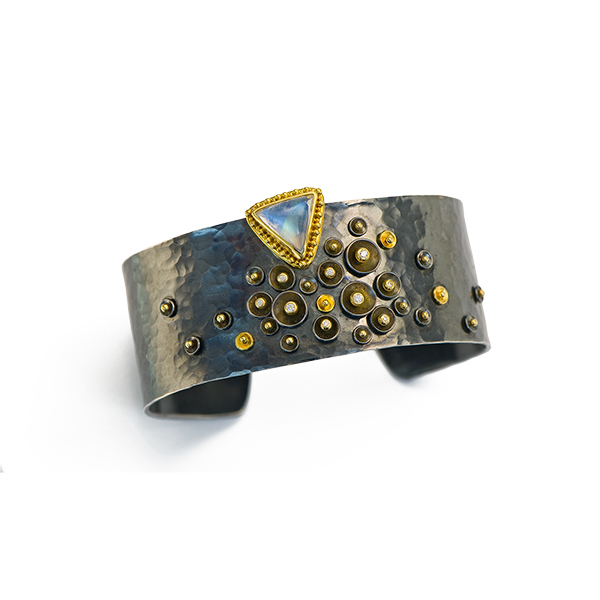 Bangle is set with Diamonds (.35tcw) on an oxidized sterling silver bangle. Cuff is set with a rose-cut Blue Moonstone (10.8mm, 4.20cts) and Purple Sapphires (3mm, .24tcw) in granulated 22kt yellow gold on a forged and oxidized sterling silver bracelet, 8mm wide. 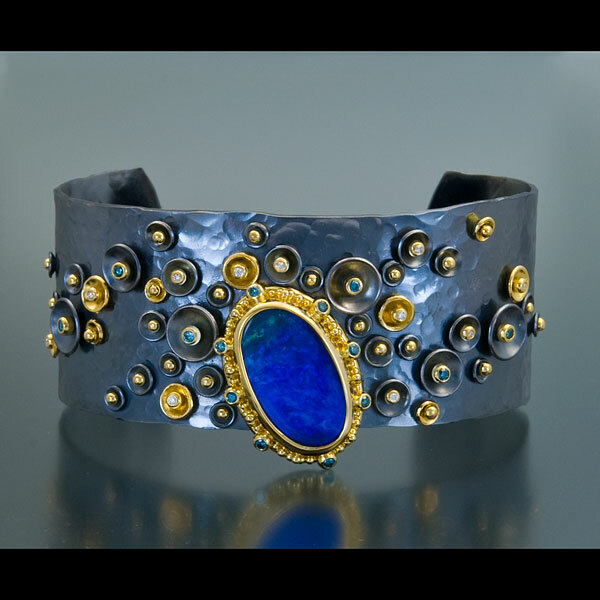 Cuff Bracelet is set with an Australian Boulder Opal (11.7 x 19mm, 6.48cts), Blue Diamonds (.21tcw) and White Diamonds (.06tcw) in granulated 22kt yellow gold on forged and oxidized sterling silver. 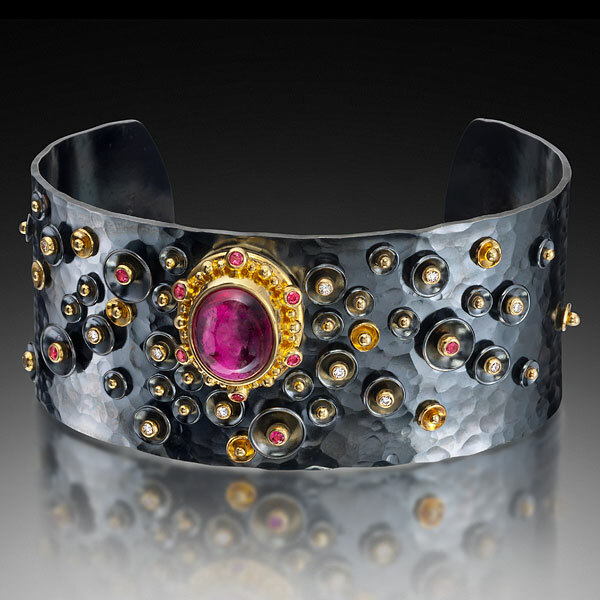 Cuff bracelet is set with a Pink Tourmaline cabochon (4.48cts), Hot Pink Sapphires (.20tcw) and Diamonds (.12tcw) in granulated 22kt yellow gold on a forged and oxidized sterling silver. 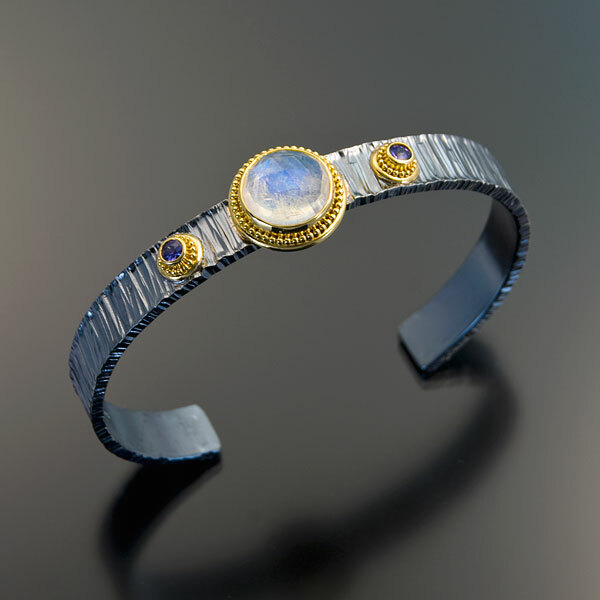 Cuff bracelet is set with a Moonstone (9.5mm, 2.72cts) and Diamonds (.08tcw) in granulated 22kt yellow gold on forged and oxidized sterling silver. 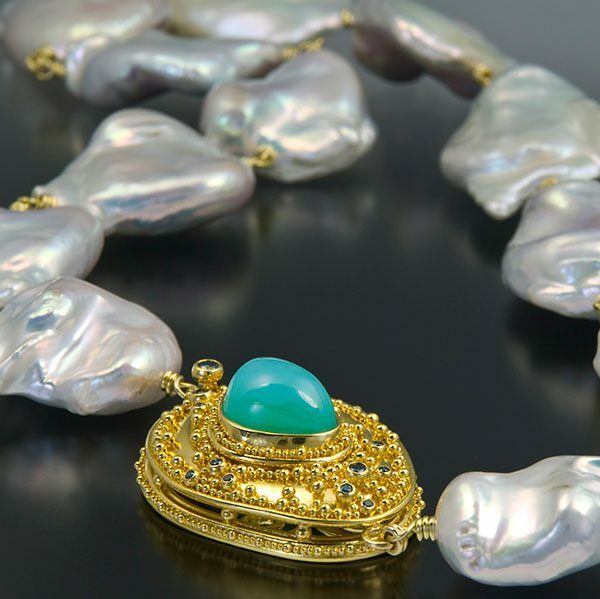 Necklace has one strand of White Freshwater Petal Pearls, Aquamarine smooth briolettes and Aquamarine faceted beads with 18kt yellow gold elements and a forged, oxidized sterling silver clasp and link set with Yellow Sapphires (.68tcw) and a Blue Sapphire (.07cts), 24″ in length. 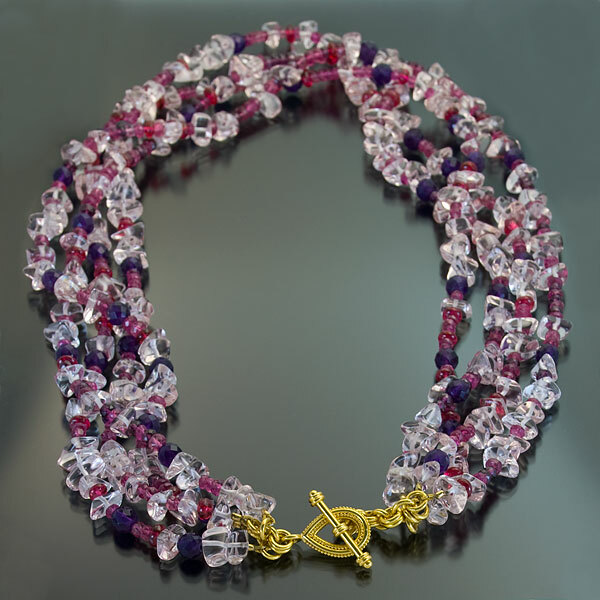 Necklace has one strand of Rose Quartz large nugget beads and Pink Tourmaline nugget beads with 18kt yellow gold elements and a forged, oxidized sterling silver clasp and link set wtih Pink Sapphires (.39tcw), 27″ in length. 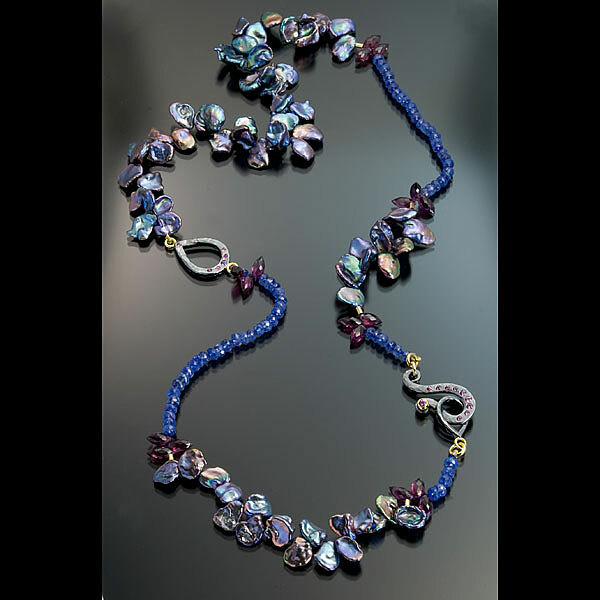 Necklace has one strand of Black Freshwater Petal Pearls, Rhodolite Garnet faceted briolettes and Tanzanite faceted beads with 18ktyg elements and a forged and oxidized sterling silver clasp and link set with Pink Sapphires (.45tcw), 26″ in length. 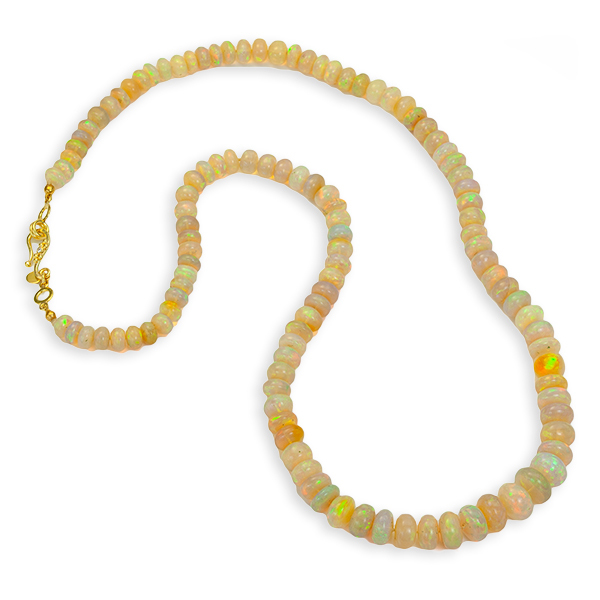 Neckace has one strand of Apatite faceted beads and a fixed Pendant set with an Australian Boulder Opal, the clasp is in 22kt and 18kt yellow gold, 18″ in length. 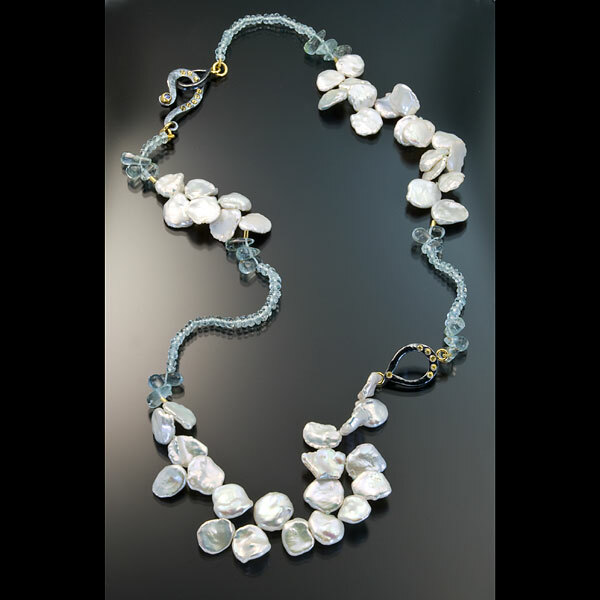 Necklace has 21 strands of Australian Blue Keshi “Twig” Pearls with a granulated 22kt yellow gold toggle clasp and a Blue South Seas Baroque Pearl and Diamond drop. 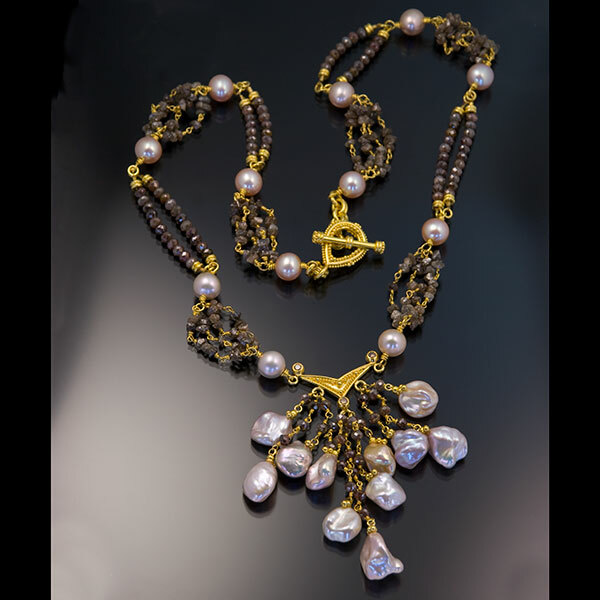 Necklace has rough and faceted Cognac Diamond beads, Pink Freshwater Keshi Pearls and Pink Freshwater round pearls with a granulated 22kt yellow gold central element and toggle clasp, 20″ in length. 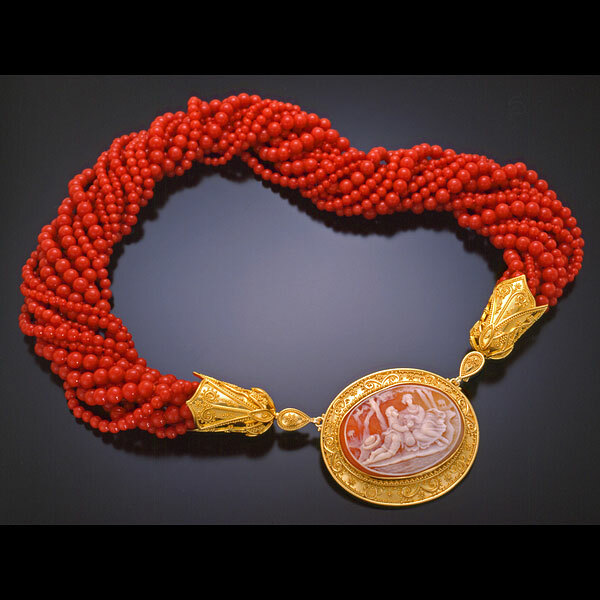 Nine strands of Sardinian Coral Beads with granulated 22kt yellow gold terminations. 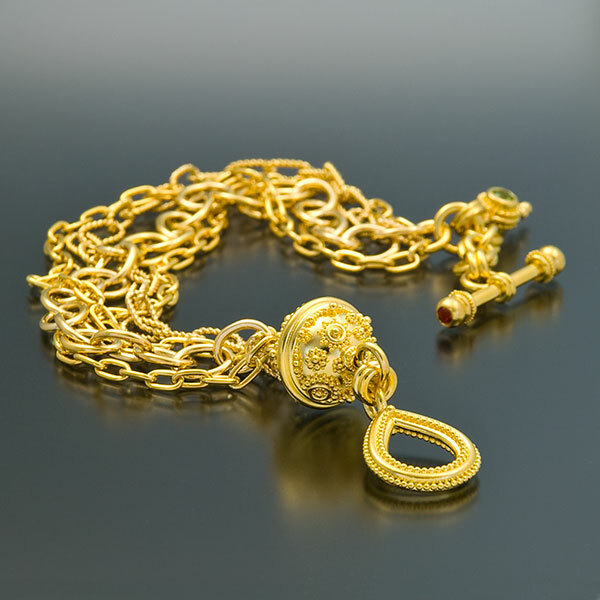 Clasp is set with a carved Shell Cameo set in granulated 22kt yellow gold with 18kt yellow gold. 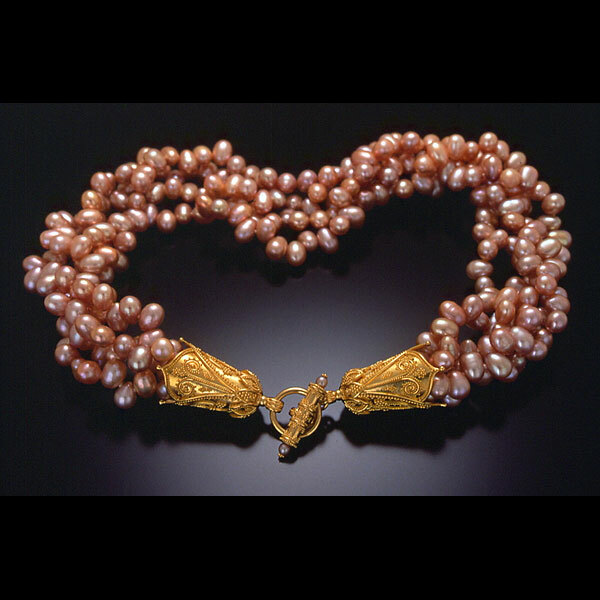 Five strands of Peach Freshwater Pearls with granulated 22kt yellow gold terminations and toggle clasp, 19″ in length. 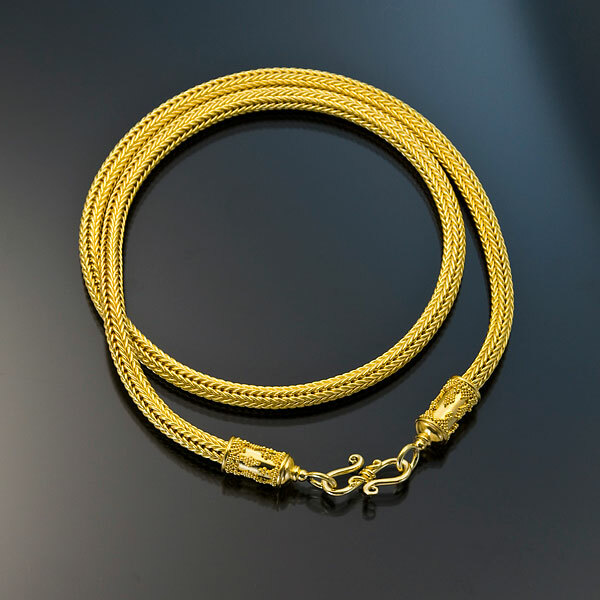 Granulated 22kt yellow gold elements attached to an 18kt yelllow gold chain, 16″ in length. 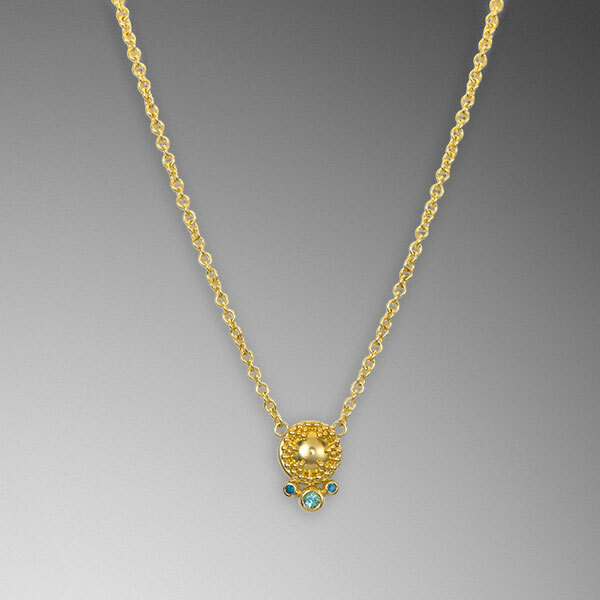 Necklace is set with a Diamond in granulated 22kt yellow gold elements attached to an 18kt yellow gold chain, 18″ in length. 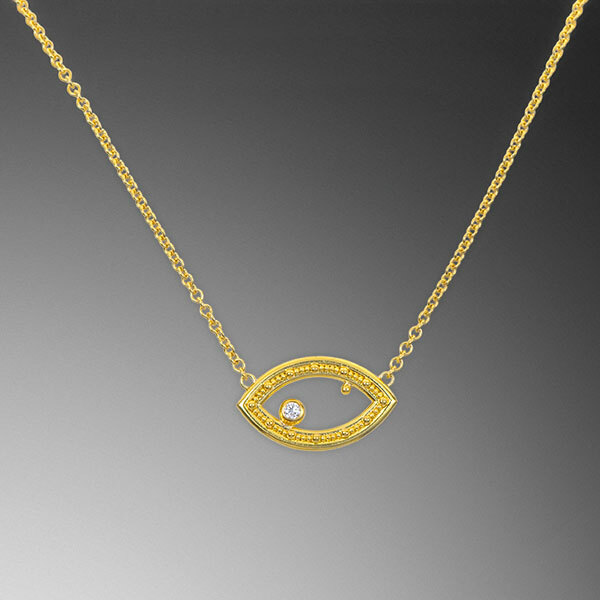 Necklace is set with Moissanites in 22kt yellow gold with 22kt yellow gold and Platinum granulation all on an 18kt white gold chain. 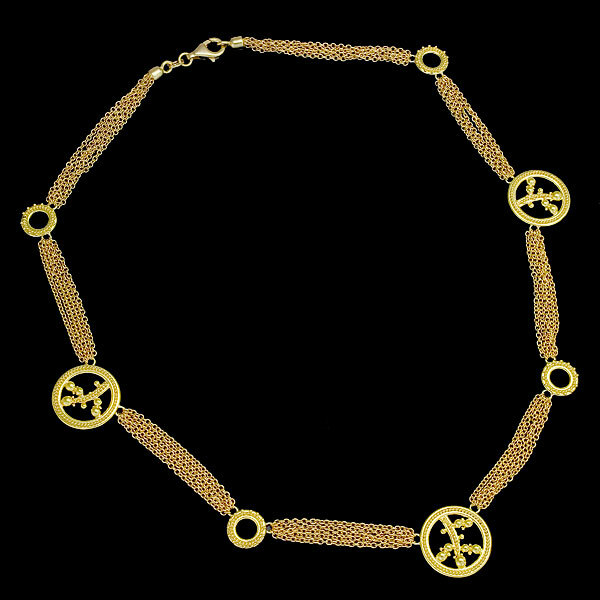 Entirely hand fabricated traditional roman weave necklace in 22kt gold, 4mm wide, with granulated 22kt yellow gold terminations and a 18kt yellow gold s-hook clasp. 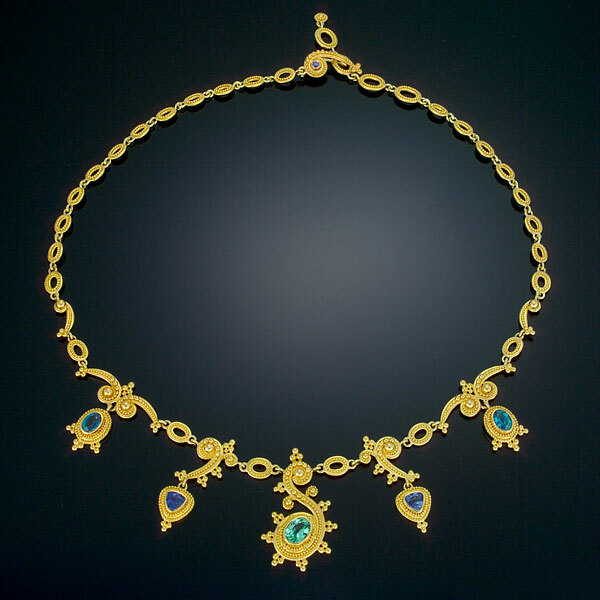 Necklace is set with a Vanadium Chrysoberyl, Purple Sapphires and Blue Zircons in granulated 22kt yellow gold with 18kt yellow gold, adjustable length: 15″ to 19″. 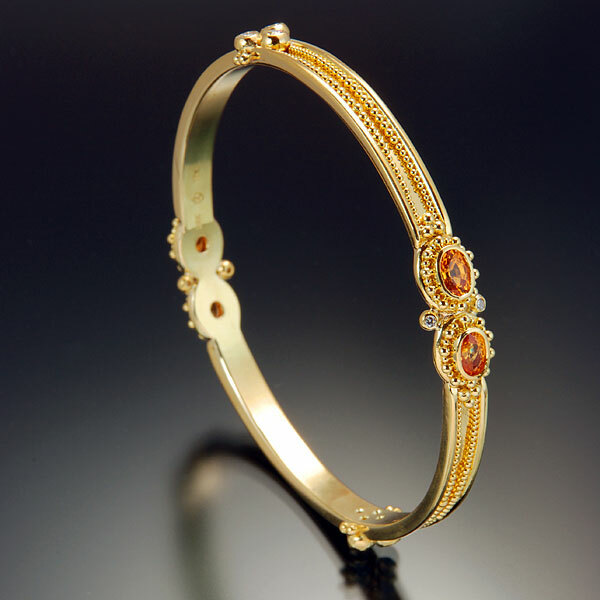 Bangle Bracelet is set with Orange Sapphires and Diamonds in granulated 22kt yellow gold with 18kt yellow gold. 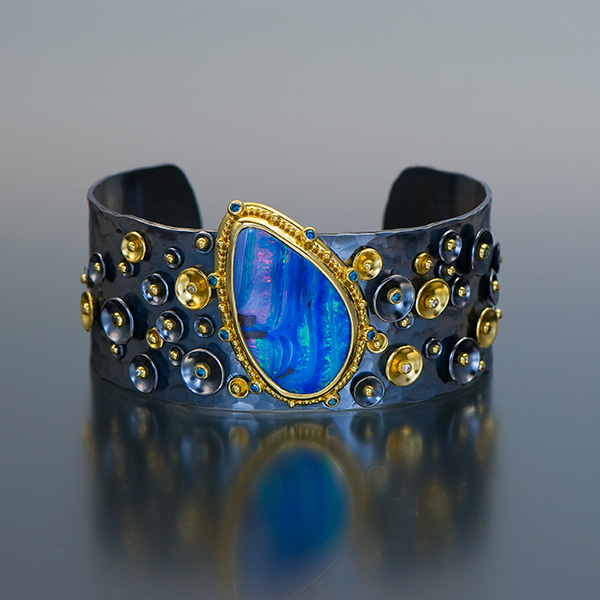 Hinged bangle bracelet is set with Australian Black Opals, Blue Zircons and Purple Sapphires in 22kt yellow gold with 18kt yellow gold. 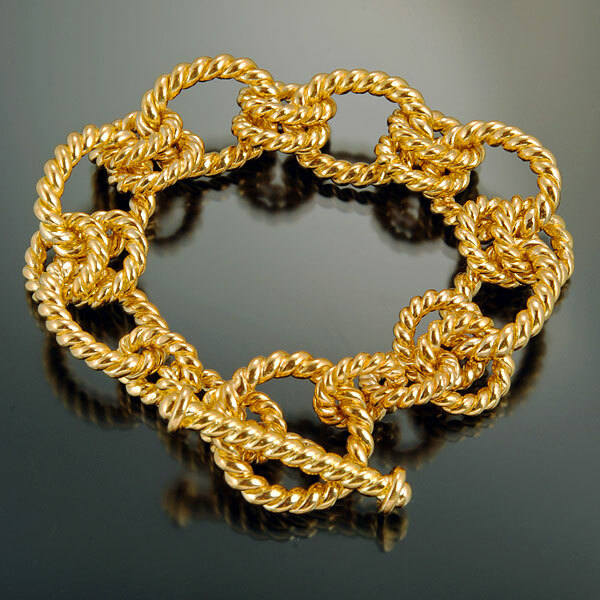 Hand fabricated twist link bracelet with toggle clasp in 22kt yellow gold. 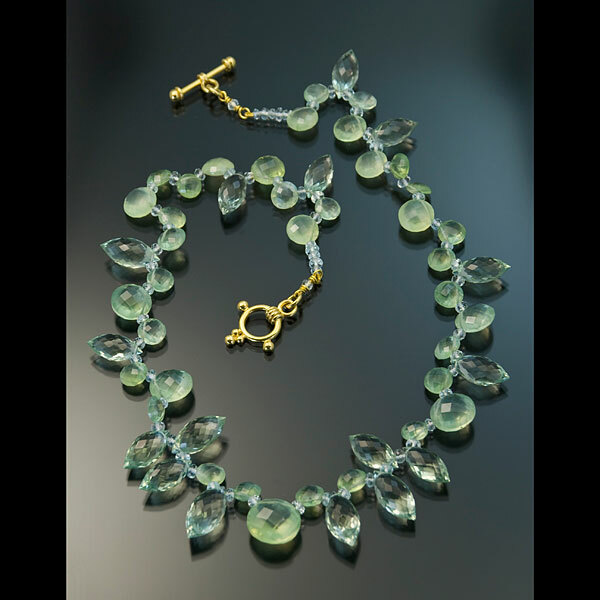 Necklace has one strand of mixed Prehnite, Prasiolite and Aquamarine beads with an 18kt yellow gold toggle clasp, 18.5″ total length. 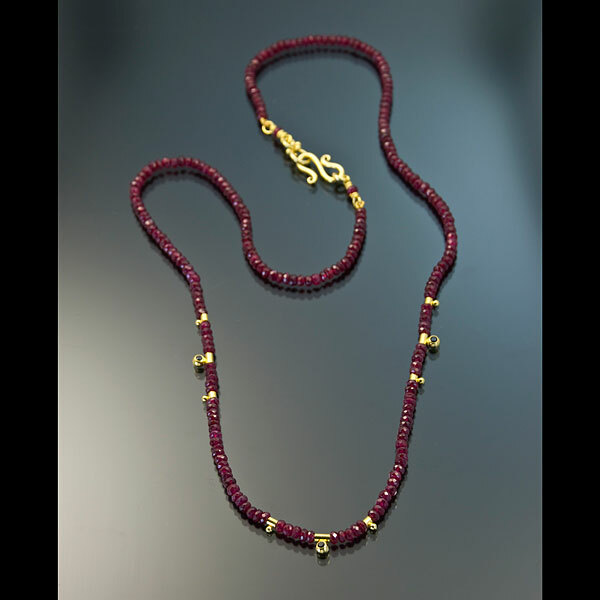 Necklace has one strand of faceted Ruby beads interspersed with 22kt yellow gold stations of which 3 are set with Black Diamonds (.09tcw) and the s-hook clasp is in 18kt and 22kt yellow gold, 19.5″ total length. 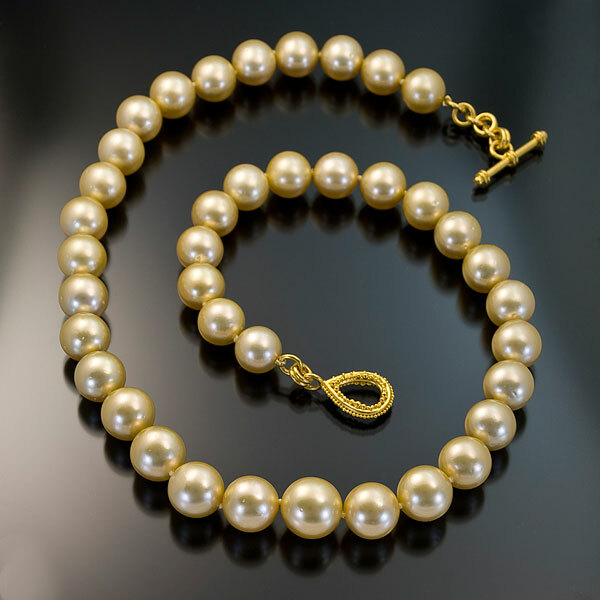 Necklace has one strand of Golden South Seas natural pearls, graduated in size (11 to 14mm) with a granulated 22kt yellow gold toggle clasp, 19″ in length. 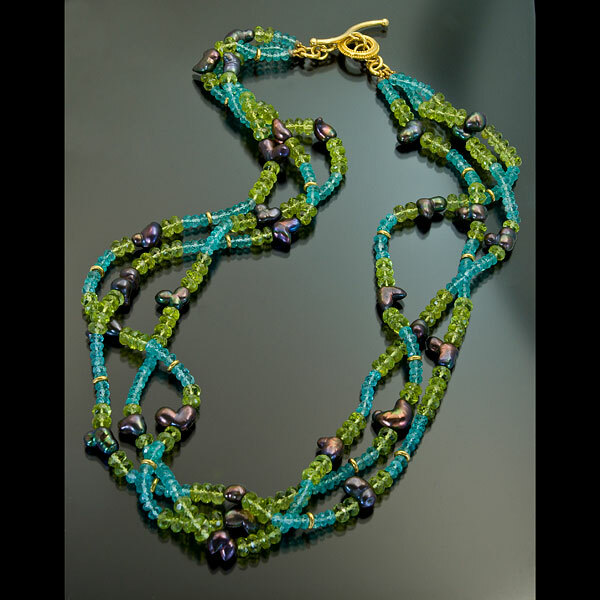 Necklace has three strands of mixed Peridot faceted beads, Apatite faceted beads and Black Freshwater nugget pearls with 22kt yellow gold roundels and a granulated 22kt yellow gold toggle clasp, 20″ in length. 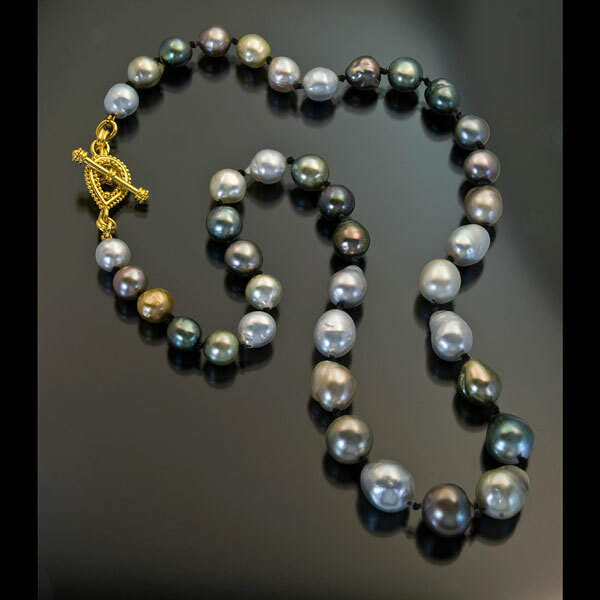 Necklace has one strand of Tahitian and South Seas natural multi-colored baroque pearls, graduated in size (8.5 to 12.5mm) with a granulated 22kt yellow gold toggle clasp, 21″ in length. This magnificent neckpiece is named for the Finnish goddess of the forest and features lime-green Chrysoberyls (24.99tcw), mint-green Tourmalines (6.34tcw) and Diamonds (3.78tcw). 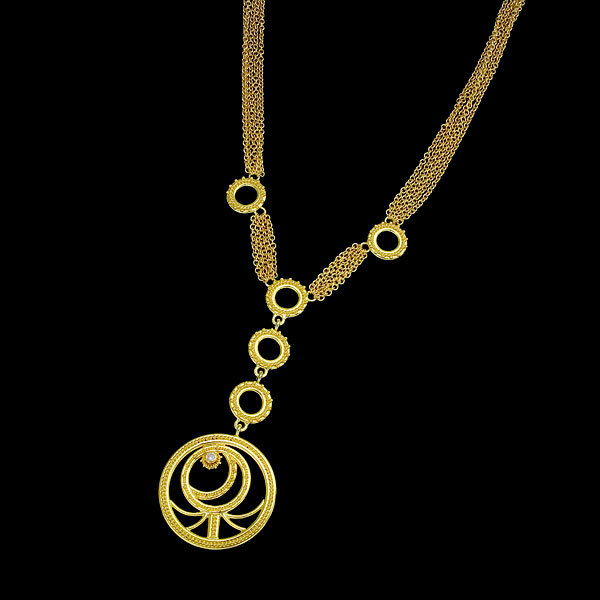 It is entirely handcrafted in granulated 22kt yellow gold with 18kt yellow gold links and has an adjustable length clasp (from 15″ to 20″). 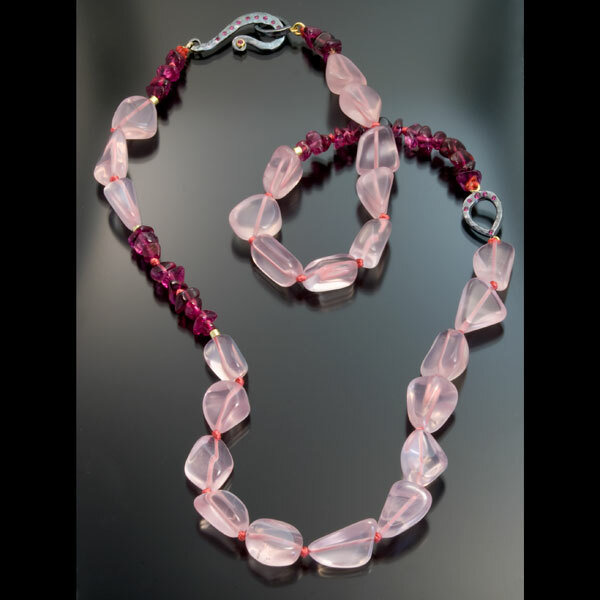 Necklace has four strands of Morganite nugget beads, Red Spinel roundels, Pink Tourmaline faceted beads and Rhodolite Garnet faceted beads with a granualted 22kt yellow gold toggle clasp, 18″ in length. 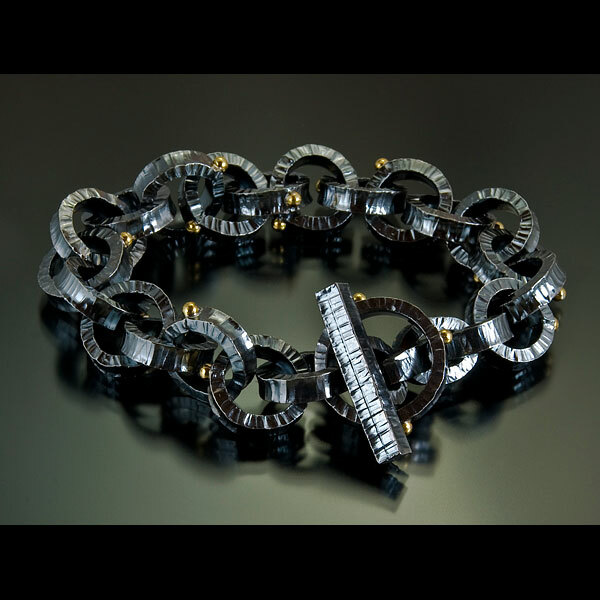 Link Bracelet is in forged and blackened sterling silver with 22kt yellow gold granule details and a toggle clasp. 9″ in length.